Norsemen: Seasons 1 & 2, It's good to be the chieftain? Waiting for the return of Game of Thrones? Missing the awkward comedy of The Office? 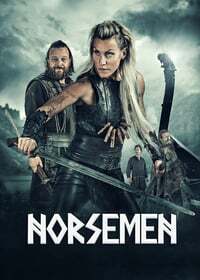 Check out Norsemen on Netflix! This was created and filmed in Norway, using Norwegian actors, who filmed each scene in Norwegian and then in English. The production values are excellent and there are many beautiful panoramic shots of the countryside. There are currently two 6-episode seasons which have an overall dramatic arc. I'm mostly posting this to see if others have watched it and have OPINIONS. If you like awkward comedy and dry humor, you'll probably like this. So much of the comic value just comes from the slightly tentative, Norwiegian-accented phrasing. This is the Office meets Vikings. There are some bits that push against my boundaries of good taste a bit, but for the most part I've been greatly amused by this show (if you haven't watched but are thinking about it, here's an example - the second season opens with a scene of two guys working together, one of them wondering if he should grab a quick bite or if the whole group will be doing a meal together later, because he doesn't want to eat alone and miss the group meal, but he's hungry now and the whole thing is just the light, awkward conversation you might have with a co-worker, until the camera pans back and reveals that they are toiling together in the aftermath of a raid in which they killed a lot of people; violence and pillaging are background jokes on this show). Jarl Varg is an awesome villain. I am stunned by the choices made in the finale of S2 with respect to Froya, and when I finished S2 last night I was quickly looking to see when S3 might be coming (hopefully sometime in 2019). I really enjoy this show. I knew I was hooked from Episode 2's take on the "sneakily poisoned sword" trope. Okay, I've got to check out this show. kay, I've got to check out this show. I could force you, but a fear-based leadership style isn't really me. I love this show. I kinda hate The Office but, as a LARPer, Norsemen hits me right in that comfy space of Viking aesthetic combined with current outlooks. I love how Avrid and Froya seem so happy and and peace outside in nature together; its these strange moments of peace between bloody murder and musing about ones shortcomings. I’m only partway through the first season but I am liking it so far. The show seems to walk a line between some very distinct styles of comedy, rather than sticking to a more simple approach, which I am appreciating. OMG! The production quality was off the charts compared to similars. I'm finishing out season 2 right now, but its funnier (if drier) than I expected. Comparing it to The Office might be doing this a disservice. This is clever as hell. It took me until end of ep2 or ep3 of the first season to get hooked. I'm kind of looking forward to trying to get my hands on the original Norwegian version and compare it scene-by-scene with the English language version. Felt a weird sympathetic vibe with Letterkenny.